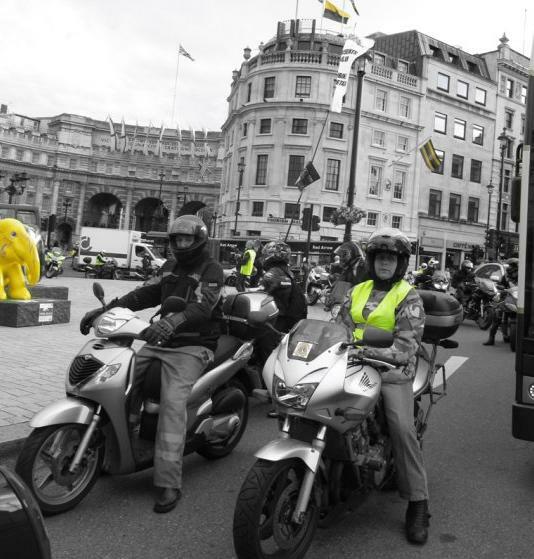 This week, the bikers went back to Trafalgar Square in Central London to cause as much road traffic disruption as possible in protest at Westminster Council’s decision to treat motorcycles like cars by charging them to park on-street. For an initial fee of £1.50 a day subsequently reduced to £1 a day, the bikers were promised security devices to lock their motorcycles to and also more parking bays on-street. Unsurprisingly, the number of parking bays in the borough did not increase at all and security devices were not installed. All motorcycle parking bays used to be free of charge and the council suddenly started to charge for their use without providing any additional service to justify the charge. What used to be provided for free, i.e. the most basic bays one can possibly imagine with a bit of white paint to mark the edges of the bays, is now subject to the payment of a stealth tax to make the council wealthier. Since paper based payment methods are not practical for motorcycles, the council offers only one payment method to the bikers, that is by mobile phone and debit/credit card, which gives rise to social exclusion issues for those who don’t have a mobile phone and/or bank card. But we have learned from fellow bloggers, Nutsville, that “the City Council does not consider that payment for motorcycle parking discriminates in any way”. This is a typical response from a public authority that regards itself as above all reproach. After a well earned Christmas break, the bikers have resumed their Wednesday gatherings at Trafalgar Square, where they simply ride their motorbike or scooter as if they were driving a car. “They have decided to charge us to park like cars, so we have decided to behave like cars”, said one protestor. By leaving plenty of space in between them, riding at the minimum legal speed limit and occupying the whole space for one hour on one of Central London’s most vital roundabout, the bikers cause enormous traffic jams during rush hour, thus delaying thousands of Londoners on their way to and back from work. In normal circumstances, bikers do not cause congestion thanks to the small space occupied by their machines and also to their ability to filter through traffic and ride around stationary cars. But on Wednesdays (morning and evening), they choose to behave like cars by remaining stationary in traffic, thus causing complete mayhem all over the place. These weekly protests have been going on for well over a year and the number of bikers attending have increased week after week. Westminster Council and TfL (Transport for London) have tried everything they possibly can to stop the bikers exercising their legal right to protest, but without any luck. Even the Mayor of London, Boris Johnson, threatened the bikers to lose access to bus lanes if they didn’t stop their weekly protests. The bikers’ protests are perfectly legal, there is nothing in the highway code to suggest that a bike must or must not filter through traffic. In fact, there is no piece of legislation that suggests that bikes cannot be driven like cars and are not allowed to congest, since they are subject to the same highway code as all other road users. By treating bikes like cars, Westminster Council is making the lives of thousands of commuters a complete nightmare every Wednesday. And this weekly mayhem is not about to stop, unless of course the council scraps the motorcycle parking tax, or is forced to do so. 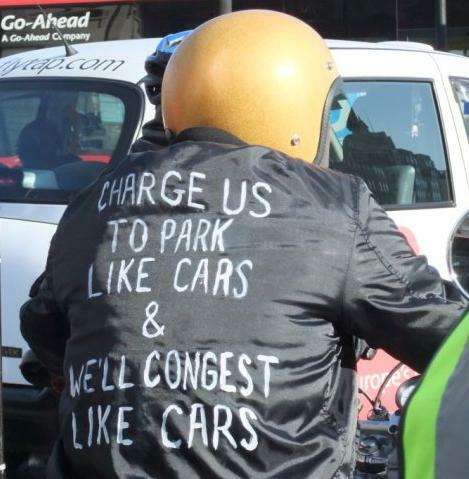 If you fancy joining the fun on Wednesdays to express your opposition to being stealth taxed to park your bike, then join the No To Bike Parking Tax group at Villiers Street in Central London at 7.30am and/or at 5.30pm. Or if you’re not joining, then try and avoid Westminster on Wednesdays. It now turns out that additional on-street parking is now devoted to the exceptionally large areas reserved for Boris Bikes Inc,. This was the hidden agenda we were unaware of two years ago. Now I wonder ??????????? ?